It explains in great detail how the antenna tuner at the input terminals of the feed line provides a conjugate match at the antenna terminals, and tunes a non-resonant antenna to resonance while also providing an impedance match for the output of the transceiver. Walt Maxwell made much of conjugate matching, and wrote often of it as though at some optimal adjustment of an ATU there was a system wide state of conjugate match conferred, that at each and every point in an antenna system the impedance looking towards the source was the conjugate of the impedance looking towards the load. This is popularly held to be some nirvana, a heavenly state where transmitters are “happy” and all is good. Happiness of transmitters is often given in online discussion by hams as the raison d’être for ATUs . Lets put all that to the test with a simple but ver relevant scenario, lets examine the impedance at the output connector of a T match ATU loaded with Z=50+j50Ω, and adjusted for an input impedance of 50+j0Ω. Above is the Smith chart solution of the network matched for Zin= 50+j0Ω (ie matched to a 50+j0Ω source). Inductor is 8.6µH with Q 100, source side capacitor is 500pF and lossless, output capacitor is 378pF and lossless. Now by Walt Maxwells assertion above, there is at ALL points in this network simultaneously a conjugate match, the impedance seen looking towards the source at any point is the complex conjugate of the impedance looking towards the load. Lets exchange the values of C in the Smith chart model and change to load impedance to 50+j0Ω to model the impedance seen from the output port (where the 50+j50Ω was connected) looking back towards the 50+j0Ω source. Above, the impedance looking back should be the conjugate of 50+j50Ω which is 50-j50Ω, but it is actually 56.64-j53.48Ω. Walt’s proposition is not borne out by solving the network above, and whilst the departure here is not large, it shows that his proposition does not apply to lossy networks in general. The departure is greater for transformation ratios further from unity, and the departure for cascaded elements of a system accumulate. Since it can be demonstrated that his proposition does not apply to lossy networks, then his all of his statements applying to real world systems (which necessarily contain loss) and that depend on his proposition collapse. There is not a system wide conjugate match in real world systems, and the benefits that are claimed to follow are not realised. The problem is that Maxwell silently dropped from his statement (1) above the requirement that networks and lines must be lossless, and the example calculated here shows that Maxwell’s proposition does not apply to real world networks that have loss. Recourse to simple linear circuit analysis will reveal that lossy networks do not have the property Everitt ascribed to lossless networks. 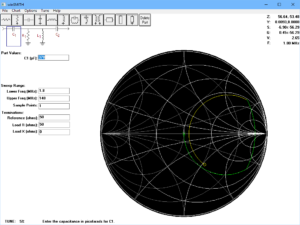 Walt Maxwell’s congugate mirror does not apply in the real world, and the concept is of little use in understanding real world antenna systems. When you see people sprouting the Walt’s congugate mirror you can expect that they have not read widely or thought about the subject much. Duffy, O. Mar 2013. The failure of lossless line analysis in the real world. VK1OD.net (offline). Everitt, W L. 1937 Communications Engineering, 2nd ed. New York: McGraw-Hill Book Co.
Everitt, W L, and Anner, G E. 1956 Communications Engineering, 3rd ed. New York: McGraw-Hill Book Co.
Maxwell, Walter M. 2001. Reflections II. Sacramento: Worldradio books.